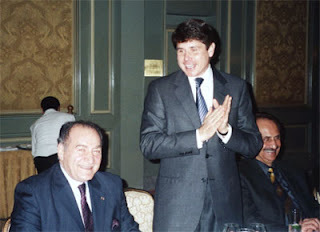 The photo above originally appeared in a “Middle East website” and shows, left to right, Nadhmi Auchi, then Governor Rod Blagojevich, and a man who appears to be the then Iraq Minister of Electricity, Aiham Alsammarae, pictured alone below. 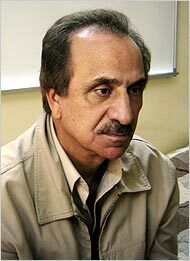 Alsammarae now lives in a northern suburb of Chicago. Bin 2008, Walden doggedly examined Nadhmi Auchi’s involvement in Illinois politics. His piece below was posted by WikiLeaks. It focuses on the extensive efforts taken by Auchi’s lawyers to suppress references to their client, worldwide. Some of the links in the original may no longer work. “Nadhmi Auchi, seen here with the Governor of Illinois, Rob Blagojevich (middle) at a 2004 Chicago dinner in Auchi's honor arranged by Antonin Rezko (potentially, right ) [It’s not Rezko in the photo.] All three men have been convicted of corruption related charges (Auchi 2003, Rezko 2008, Blagojevich 2009). The Auchi-Rezko-Obama connection came to public attention with federal marshals pounding on the door of Tony Rezko’s Wilmette Chicago mansion in the early morning of January 28, 2008. They hauled Rezko to jail after his bail was revoked for concealing a $3.5 million Auchi loan from the court. The Times outlines the story in two sentences. It should be of tremendous interest to the American public and the world. Journalists digging into stories involving Auchi often find themselves peppered with threats of libel litigation from a London law firm known as Carter-Ruck. Auchi’s litigation threats have chased eight articles from the internet sites of the UK Guardian, Observer and New Statesman. WikiLeaks itself is now under legal attack by Auchi’s lawyers. Perhaps hoping to inspire “fear and surprise” with “ruthless efficiency” Carter-Ruck demand letters—laden with misspellings and what appear to be cut-and-paste formulations--have been going out not only to large British newspapers, but also to American newspapers and both well-known and obscure bloggers. Posted on April 23, 2008—in the midst of the US Presidential race--an article on Auchi’s Middle East Online website boasted of knocking six articles off of the Guardian and Observer websites. Bloggers began receiving Carter-Ruck letters demanding that allegedly defamatory comments be removed from their comments section. MEO displayed a sphinx-like image of Auchi. The caption: "Tracking even the search engines." Read Walden’s thorough refutation of Carter-Ruck’s position here on WikiLeaks.